It's not often that we see a trade where both sides end up happy, so a three-team trade where all parties end up pleased with their end are rare. A year and a half later, I think it's safe to the say the Diamondbacks, Tigers, and Yankees are all happy with their haul from last winter's Curtis Granderson–Max Scherzer–Ian Kennedy–Edwin Jackson (plus others) swap. Many questioned Arizona's motives behind the trade, but as Joe Pawlikowski of FanGraphs recently explained, it's the deal that keeps on giving for them. Kennedy was everything the Diamondbacks could have hoped for in the first year after the trade, giving them 32 starts and 194 innings with a 3.80 ERA last season. His peripheral stats were strong as well: 7.79 K/9, 3.25 BB/9, 4.33 FIP, and 2.4 wins above replacement. Kennedy's second year in Arizona has gone even better; his 3.38 ERA is supported by a 3.50 FIP, and he's maintained a similar strikeout rate (7.58 K/9) while lowering his walk rate (2.35 BB/9) and increasing his ground ball rate (40.5%). After just 112 1/3 innings, he's already provided his team 2.3 wins above replacement. Romero signed a five-year contract worth $30.1MM last August, a deal that also includes an option for a sixth year. It bought out his last remaining pre-arbitration year, all three arbitration-eligible seasons, and at least one free agent season. The Diamondbacks have Kennedy under team control through 2015, and he won't be eligible for arbitration until the 2013 season. 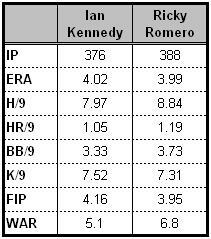 A five-year deal would buy out the same years of his career as Romero's deal, and it would still allow Kennedy to hit the free agent market at age 31, young enough to land one more big contract. It's worth mentioning that both Yovani Gallardo and Jon Lester received similar five-year contracts worth $30MM or so, the kind of deal Kennedy has set himself up for when you adjust for inflation. There's no pressure on the D'Backs to sign their young right-hander to a long-term deal now, but doing so could save the team some major bucks down the line.